Whether you've smoked for a year or 50, it is never too late to quit smoking. Health benefits for seniors that quit smoking can be seen almost immediately through a lower heart rate and improved lung function. Non-smoking seniors will also notice improved senses and less coughing. Remember, you're never too old to see the health benefits of quitting smoking. Many smokers experience a range of health problems from lung disease to cancer. Everyday life can be drastically improved simply by stopping smoking. If you are a senior who smokes, consider the many benefits that you can experience if you quit the habit. Quitting now, no matter what your age, will give you a longer life and will decrease your chances of having a disease associated with smoking. If you quit smoking, your taste and smell will be intensified since smoking dulls these senses. Food will taste differently to you and be more enjoyable. Other benefits of quitting include an increase of energy, less trouble breathing and better circulation. This means that activities such as walking and running will be easier to do than they were when you were smoking. Do you wake up each morning with a nagging cough? That cough is a result of phlegm that builds up in the lungs from smoking. If you quit smoking, you will gradually notice that the cough lessons or ends completely. The American Cancer Society (ACS) reports that once a smoker quits that the cilia in the lungs regain their normal function and are able to handle the mucus being produced. 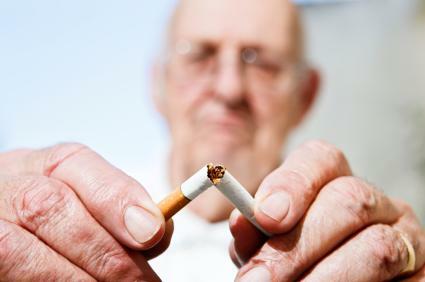 According to the NCI, quitting smoking can reduce the risk of cancer and diseases such as COPD. Those who decide to quit at age 50 can reduce the risk of dying prematurely by 50% compared to those who never quit. Those who quit at age 60 can benefit from living longer and reducing the risk of disease. Other noticeable benefits, according to the ACS, are ones that are visible to others. For example, teeth and fingernails are no longer yellow. Those around you will also notice that your hair, clothes and breath will smell better than it did when you smoked. No matter what age you may be when you decide to quit, you can still experience benefits in your overall health and well being. Don't think that because you are over a certain age that you cannot benefit from quitting. You may be surprised at how your health will improve. Little things such as walking up a flight of stairs without getting winded will be possible. NCI Smoking Quitline: Call the Quitline at 1-877-44U-QUIT to get personal counseling as well as printed materials to help you quit smoking. Smokefree.gov: Created by the NCI, this site features a step-by-step guide to quitting as well as resources such as online quizzes, tools that can help you quit and guides to medications as well as links to resources in your area. American Cancer Society: The ACS offers The Guide to Quitting Smoking as well as brochures on preventing and treating cancer. To order free materials by phone, call 1-800-227-2345. If you have a friend or family member who smokes, ask them to quit along with you. The more support you have, the easier the process will be. Friends and family know you best, and can help you through the tough times and encourage you to quit the habit of smoking to improve your health.